Jamaica: The place to be. When you hear Jamaica, maybe you think tropical reggae rhythms. Or maybe your mouth starts to water at the thought of jerk chicken. Or maybe you think white-sand beaches and mountain waterfalls. You’re spot on, but this easy-going island is full of surprises. From world-renowned golf courses to outdoor adventure, check out why the third-largest Caribbean island should be at the top of your bucket list. Sure, most of the islanders speak English. But did you know that Jamaicans also speak Patois? Patois, the island’s main dialect, includes phrases like “yah mon,” “wah gwaan” (what’s up), and “irie” (everything’s going alright). Chances are, you’ve heard some of this language in your favorite reggae. Looking to get into the rhythm while on vacay? There’s no shortage of local bands, but a trip to the village of Nine Mile for a tour of Bob Marley’s home and final resting place should be on every music fan’s bucket list. Next up is Jamaican cuisine. And this one’s important. Jamaican food is all about flavor and all about the spices. So, if you want to experience the island like a local, find a roadside jerk chicken stand. 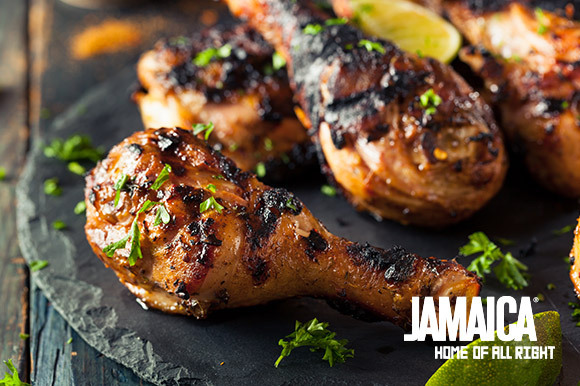 Jerk is a popular blend of spices including scotch bonnet peppers, thyme, ginger and a dash of whatever the grill master is feeling that day. Check out Scotchies’ two locations—in Ocho Rios and Montego Bay—for a reliably epic encounter with Jamaican jerk flavor. Later, be sure to sample some patties, flaky pastry turnovers filled with spiced meat. And if you’re feeling adventurous, give goat curry or guava glazed roasted pork a try. 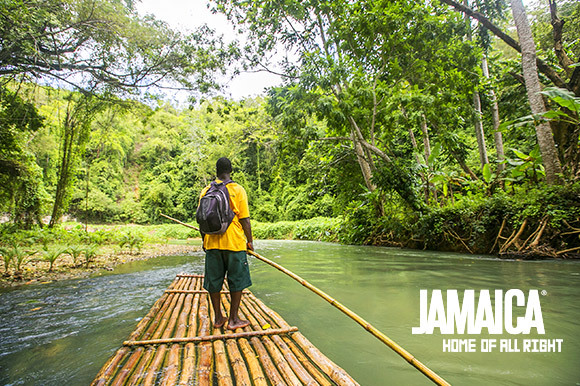 When you land in Jamaica, one thing’s clear right away. The landscapes are surreal. The lush green hillsides climb, dip, roll and are crisscrossed by rivers and bound by the Caribbean Sea. 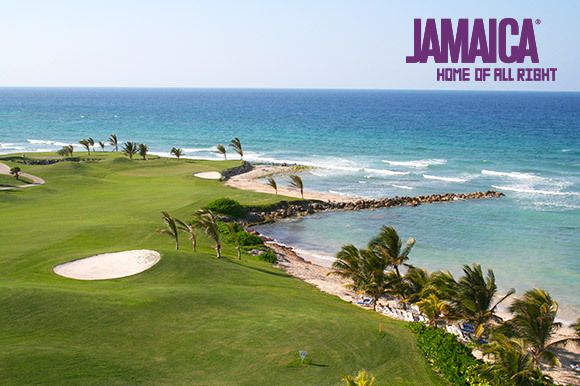 Links lovers will be happy to find that Jamaican golf courses are no different. Get ready to tee off with mountains at your back and to sink seaside putts. At Cinnamon Hill Golf Club, you’ll find a breezy course along the coast, and a challenging, mountainous back nine. Higher in the hills on the old Rose Hall Estate, The White Witch Golf Club serves up stunning views and exciting elevation changes. When you’re ready to ease into some off-the-beach adventure, make your way to the Martha Brae River. Hop onto a guided bamboo raft and enjoy the cool shade of bamboo and banana trees along the banks while you meander downstream (maybe your guide will even share the legend of Martha Brae with you). For a slightly wilder ride, head to Blue Mountain Peak (Jamaica’s highest) for some challenging, grin-inducing mountain biking. Or saddle up to see the countryside by horseback. 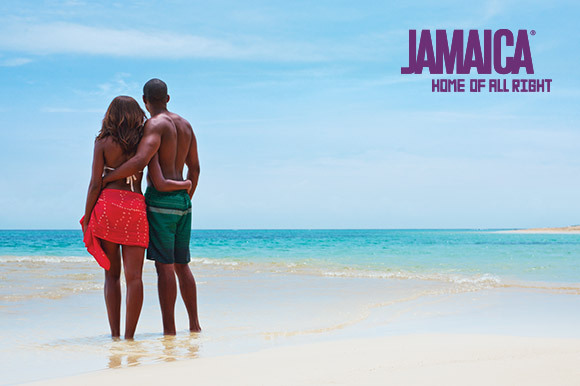 Ready to make your great Jamaican getaway? Make it happen.